Be Brave: Fave DIY Bracelets Styles! Hello Hello! So today just gonna share some DIY tips I've picked up from YouTube and since primary school days. It is also my take on some of my favourite bracelets designs! Been delaying this post for a really long time, hahas. The interest to make them came back somehow,heh. 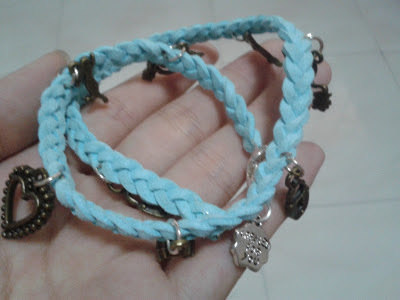 Since making your own bracelets had been a trend lately, think now kinda died down already but I still think its a fun and affordable way to create your personal bracelets to wear out and even get compliments on it! It is also very versatile whereby you could change it up to become part of bookmarks, mobile straps, anklets or just a simple key chain! Possibilities are endless if you can think of more creative ways to use/show them off, hehes! For different types of strings,beads,closures,buttons you can get them at Spotlight, Beadspin or any craft stores. I've got mine from both places, and Qoo10 (G-market ) for charms and the rest from mom's sewing kit. I've done quite a few different types of bracelets so gonna introduce each design at a time. For staircase knot, it is another change up of square knots. What you'll need to do is also just start off with 4 strings, then do the same step as you would like for the square knots BUT continue to do the knot in one direction only. Example: you started tying the knot at the right side, keep tying at the right. If you start tying from the left, continue tying left. This is my favourite of all, though it is kinda tedious but the end result is quite satisfying for me. Follow the steps like the video below! For this design, found it on YouTube by chance and also a very simple pattern to do! This design is a tad confusing, the pattern will always change, however eventually you will start the the same sequence by colour after completing a series of knots.